Before I ever stayed in hostels I imagined them to be dirty, uncomfortable and loud. I was wrong of course, I'd painted such a negative picture which wasn't true. 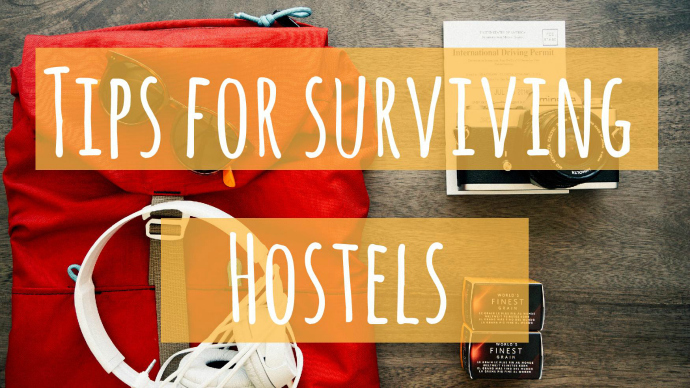 Well, some hostels are dirty, uncomfortable and loud but on the whole they're pretty decent and help you save some money. This may sound odd but more and more hostels are beginning to have a curtain you can pull across your bed area for when you sleep or when you want some privacy. I personally, really like this as I sleep better when I don't feel like people can see me sleeping. If you're a light sleeper then sharing a room with other people and having people going in and out of the room may keep you awake. I've found that having a pair of earplugs handy helps a lot. They don't shut out all the noise but they block out enough to get some sleep. Another way to help guarantee you a bit of sleep is to book a room with less people in. For example, in a four bed room you only have three other people to worry about or less if you're already travelling with someone. Obviously, this can back fire and you could be sharing with less people but have the loudest people in the hostel! But this depends. In my own experience I've found *most* smaller rooms to be booked by people who want more privacy and quiet so basically people who are on the same wave length as you. Small rooms are perfect if you're travelling in a group, especially a group of four. You can have the whole dorm room to yourself without having to pay the price of a private. You may even be able to get a dorm with an ensuite then you don't even have to share a bathroom with strangers! I'm not ever that bothered about showering bare foot in hostels, maybe I should be but usually I don't bother with flip flops. However, they still do come in useful for the walk to the shower room. Sometimes the bathroom is not that near your dorm. For example, in Mexico I had to walk through reception, through a gate, through the breakfast area outside to the shower. This was especially annoying when I needed a wee at 2am. Flip flops came in extremely handy, especially as I was having to go outside! Sometimes I do wear them in the shower too because quite frankly some hostel bathrooms are a little grim. This may seem obvious but it's always useful to not only read the description the hostels written about itself but the reviews. For example, if you're not a big drinker or partier then it's best to avoid party hostels. Most party hostels make it clear that's what they are so just double check because you don't want your trip ruined by lack of sleep. I've stopped in a few hostels and I think they're okay - the key is not to stop in the room too much.